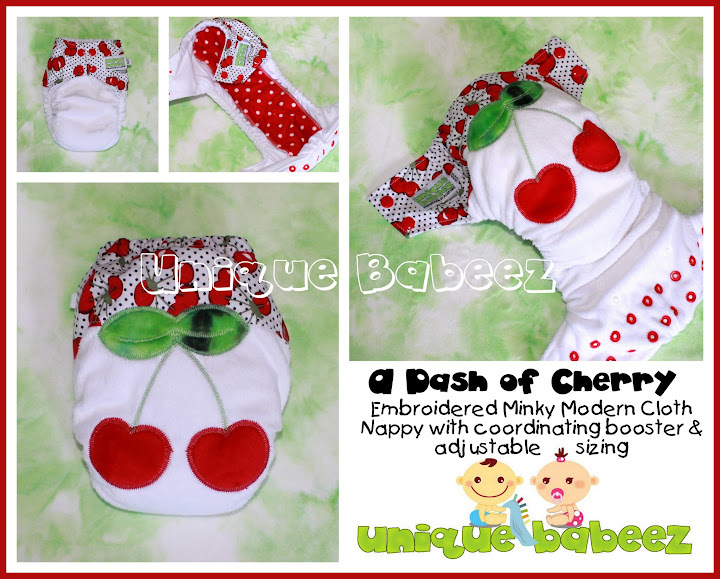 OSFA "A DASH OF CHERRY"
This listing is for a special Dash of Cherry Embroidered Minky covered Day Nappy containing a hidden layer of PUL in a One Size Fits All design using snap closures for both waist adjustments and also leg adjustments. Included are 6 super absorbent bamboo layers with an additional selection of another 3 layers for those in need of just that bit more! Please select these additional layers HERE. This beautifully embroidered White Minky with Cherry Trim Nappy features a Cherry design as well as coordinating polka dot booster with a 6 layer adjustable boosting system. Add in our mini 3 layer booster for just $3 more to get up to 9-11 layers of absorbency. One of the awesome features of UB Nappies is when your child reaches toilet training stage, but not yet ready for undies, just remove all boosting from this nappy, clip the snaps to size, and allow it to be used as a pull up for that transition time!!! - fully waterproof lined shell, meaning NO COVER REQUIRED! - providing absorbency bulk, without being bulky! - adjustable snap closure to get a great fit that will hold from exploring hands. For care of all our Unique Babeez Nappies we recommend rinsing and lightly wringing your nappies after each use and store in a dry pail or wet bag until wash time. All used nappies should be washed at least once every 48 hours (24 in humid climate areas) using suitable wash methods designed for reusable cloth nappies.